You may have had to shop for a USB duplicator for some reason or another and noticed that they can be quite expensive and the product reviews are not always very encouraging. At Foundstone, we teach a few classes that require each student to have the same Foundstone customized USB stick—thus we have a need for one of these expensive devices—especially when we need upwards of 100 sticks created in a weekend. After scouring the web and reading reviews, we resorted to buying a duplicator that was around $300 and could duplicate 7 USB sticks at a time. Our first batch finished without a hitch - until we tried to boot off of them. It turns out this product cannot duplicate a bootable USB stick which we needed for a LIVE Linux distro. We contacted customer support and they even went as far as to rewrite the software to try to get it to do what we wanted—unfortunately, without any success. When all hope was lost, we turned to some Linux dd foo. As it turns out, you don’t need the expensive hardware. All you need is a standard USB hub, dd, and some command line magic. This will vary depending on the size of your project. As stated earlier, we have to duplicate 100 or more USB sticks in a weekend, so for us… the more ports the better. 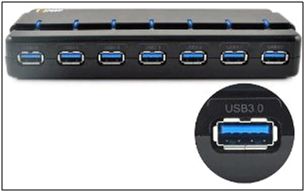 The USB hub I purchased this year was simply a hub (and not a “duplicator”), but it has 7 ports. The duplicator we originally purchased was a USB 2.0 hub. However, I also used an old Belkin USB 1.1 4-port hub to successfully test duplication as well. This year, we went with a USB 3.0 hub to determine the performance increase—if any. This is something you hopefully do not learn the hard way. When buying a USB hub, you have to keep in mind the bulkiness of the USB sticks you may have to duplicate. Take the image below for example with USB sticks of varying width. The Flash Voyager and the Verbatim stick (lower left) are wider than the Cruzer (lower right) and DataTraveler sticks (top right). If the spacing between the ports on the hub is too close together and you happen to find a wider stick on-sale when you are buying, you will not be able to fit all of the sticks into the hub at the same time—thus involuntarily reducing your 7 usable ports down to 4. We took this into consideration when we purchased the USB 3.0 USpeed hub mentioned above. As you can see in the image below there is plenty of space between the ports which accommodates the wider/bulkier USB sticks that may be on-sale. This is not too much of an issue, but it is something to keep in mind. 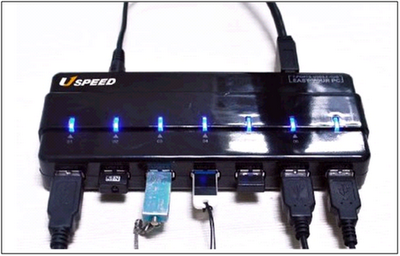 Most of the USB hubs can be powered off of the USB port itself or an external power source. When you are duplicating many sticks at the same time, you may want to plug in to a wall socket—even if you think you can power the hub via USB. The power source can sometimes affect speed and reliability of the copies. One of the deciding factors in our most recent purchase was the positive remarks about the hub (beware of shills!). We recommend choosing a hub that is industry proven and popular for speed, features, and reliability. dd is an old school *nix command that does low-level bit for bit copying. It is a very versatile and easy to use tool. Common uses are acquiring a forensic image of media, creating backup images (ISO’s) of CD’s or DVD’s, performing drive backups and now, duplicating USB sticks. There are ports of dd for Windows, but many of them have some limitation—thus we prefer to use dd natively in *nix. Ironically, since we are duplicating bootable Linux distributions, we use one of the USB sticks that we manually created in order to boot to that and make the others. We create two USB sticks the manual way (one to boot from and one to copy). Depending on the operating system, the USB sticks may be auto-mounted. It is important that you unmount the drives before starting the duplication process. There are several ways in which you can determine how the USB sticks were mounted and how to address them. [  981.231794] USB Mass Storage support registered. Duplication performance will vary depending on the setup, however in the next article we will reveal how our different setups did and hopefully extract some useful information that may save you time and money. The command syntax above worked great for us and duplicated over 100 drives with no issues at all—most of the time duplicating up to 7 drives simultaneously. As we realize that there are many ways to get the job done—if you have other commands, tools, or parameter adjustments that you have used that worked well, we would love to hear about them. Recording speed matters. Higher speed often gives poorer results. Everybody wants to go as fast as possible, and modern writers can record at very high speeds. Regarding monitoring the system log files.. what I implemented for a headless automated backup system once was to write a custom rules file for udev which in turn invoked a shell script to call crypt-setup, rsync etc.. Thanks for posting this.. I've been looking for a solution.. No one could answer if USB duplicator would work...Thanks for your hard work. 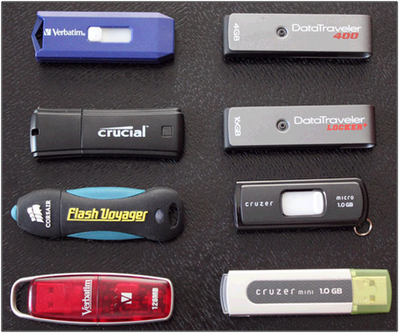 I am 100% new at USB thumb drive duplication, so if I just wanted to duplicate a flash drive with photos, videos, etc. (but like 50 copies) would I need to mess with all the command prompts and dd, foo, and all of that (which I don't quite understand), or could I just plug my thumb drives into a hub (not a duplicator), and drag and drop my vids, pics, etc into each flash drive via my computer? This would be a bug in the duplicator, obviously. That being said, I agree that for small quantities the duplicators may be overkill. Of course, for larger quantities they may not be. Note that you can also use dd to compare the contents of USB sticks, for example using sha1sum.